At the moment my wheels are spinning. There is so much coming up in the next three weeks that I can barely keep my head straight. I am trying to get through one thing at a time, like a birthday on Cinco de Mayo and Teacher Appreciation, but I completely blanked out that Graduation is just around the corner. For some of you it may have already happened!! My son is 'graduating' from Elementary school this year. Not a real graduation, but still a moment as his mom that I would like to recognize. I think it would be fun if he gave his friends these fun graduation favors. They are easy to make, if you have enough bottle caps handy, and are simple enough to be appropriate even for an elementary school graduation. In fact, I think they would be PERFECT for a preschool graduation party. 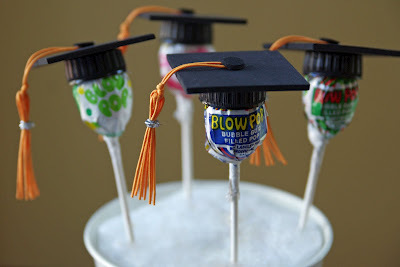 You can check out how to make these lollipop graduation favors over at Life in Wonderland. Those are cute. What ya got up your sleeve for my highschooler? Cool idea. For an added touch I would suggest wrapping the lollipops in cloth - the colors of the school and tying them off with a colored bow.